Beginning in May of 2017, I’ll be taking another group of students for a year of training and honing their skillsets. This mentorship will be unlike the last 2 years and represents a well-rounded practice of living “off-grid” and on your own ingenuity and skill-set. This will be the fourth year that I will be running a year-long mentorship to systematically teach each student to work in depth with the diverse plant based skills that are essential for nomadic hunter gathering pathways. Each student, among getting to know the plants inside and out, will also progressively be brought to a state of camping “self reliance” and have the ability to go anywhere and wildcraft food and medicine. Shelter – May 12-14 – Develop your own camp site, learn to camp and refine backpack gear, first aid kits, car packing, identify and forage edible and medicinal spring plants. Fire – July 14-16 – Once the gear and camp is easily set up, we will practice and discuss the intricacies of different firemaking aspects, including understanding firemaking techniques for different ecosystems and weather patterns, what can be harvested off of the landscape, and cooking and food preparation, This will be interspersed with plant walks, observation of growth patterns of differing plants and trees. 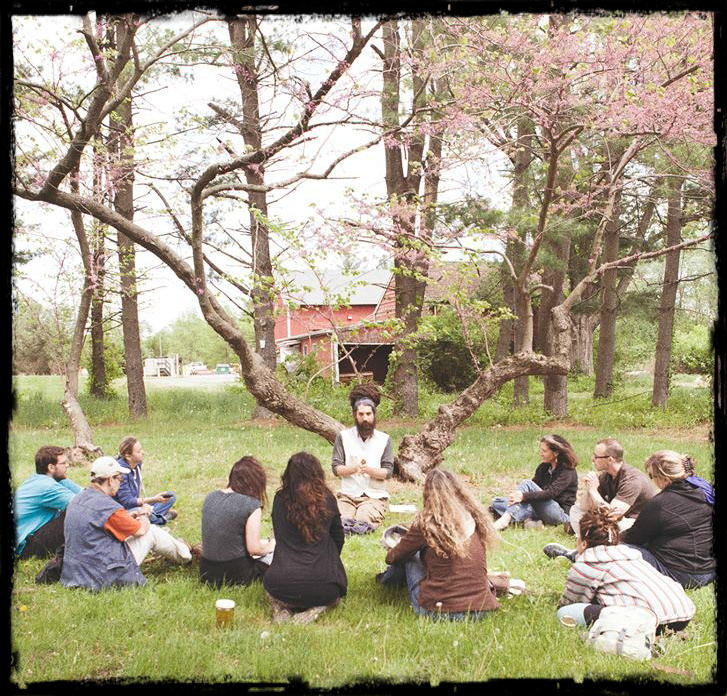 Water – September 15-17 – Wild water harvesting, purification techniques, and ways to track landscapes for acquiring drinking water, mushroom identification and hunting aspects, and herbal medicine making and preserving aspects. Food and Medicine – November 17-19 – this is the time when camping becomes colder and gear becomes refined, learn to condition your body and dress appropriately, to keep and maintain fire, to prepare foods on fire, and to make medicinal preparations from the plants we have gathered throughout our adventure. There will likely be wildcrafted mead to celebrate a beautiful year together. Access to our own Facebook group for digital hand-outs, asking questions, discussing material, and working with the collective insight and development of the group. In-field training of deep and real-life experience connecting with local plants in Nature, and gaining allies with the elements of the natural world as well as wild food cooking, and cooking on a fire. Going beyond the mind and working with intuitive perception to take our connection with the Earth to a deeper, and more tangible level. Simple and engaging assignments to complete at home and take you deeper into the lessons. Medicine making practice throughout the seasons, and journaling of experience. Suggested reading list including field guides to enhance and deepen the courses collective vision. Pay in Full – Tuition for the full course is $850 if paid in increments, or $800 if paid in full in advance for a savings of $50. Pay in Increments – A down payment of $250 is required upon registering to reserve your spot in the class. The remaining $600.00 [$850 in total] can be paid in increments, and will be paid in full by the first weekend, unless we agree upon an alternative. To register for the class or if you have any questions please email Dan@returntonature.us . Register now to reserve your spot! Want to attend mentorship with Dan but can’t make it physically? Check out the 2017 Online Mentorship Program. Excited that you will join us! So far we have 7 students with the intention of 20!